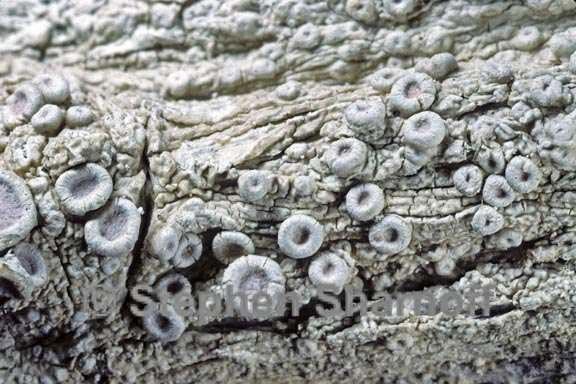 Thallus: crustose, verrucose areolate, verrucose or verruculose, becoming thin marginally: prothallus: often present areoles: thin or thick, opaque or glossy surface: white to yellowish gray, smooth to rugose, shiny, epruinose Apothecia: lecanorine, sessile or almost subpedicilate due to a constricted base, 0.6-2(-2.7) mm diam. disc: light yellowish pink to light orange, often white pruinose. K+ yellow, C+ red, KC+ red, P- amphithecium: hyaline, with a thick, well-developed medulla, often with small crystals, with a thin cortex (20-30 µm thick) exciple: hyaline, with a 15-35 µm thick: algal layer hymenium: reddish brown above and hyaline below, 210-320 µm tall; hypothecium: hyaline, 35-40 µm thick, usually with continuous algal layer below asci: clavate, 6- to 8-spored ascospores: hyaline, simple, broadly ellipsoid, 29-45 x 19-28 µm; wall: less than 1 µm thick Pycnidia: not seen Spot tests: thallus K-, C-, KC-, P-, UV +yellow to yellow-orange; medulla of the amphithecium: K-, C+ red, KC+ red, P- Secondary metabolites: cortex with lichexanthone (+major), atranorin (+trace); apothecia with gyrophoric acid (major), lecanoric acid (trace), 5-Omethylhiascic acid (+minor), 4,5-di-O-methylhiascic acid and 4-O-demethylmicrophyllinic acid (both +trace). Substrate and ecology: on bark, common in the coastal plain, especially common on Fouquieria World distribution: tropical and subtropical areas in North and South America and southern Africa Sonoran distribution: coastal southern California, Baja California, Baja California Sur, Sonora and Sinaloa and extending to southern Arizona. Notes: When lichexanthone is present, O. africana may be confused with O. mexicana, but the former differs from the latter in having a C- cortex, usually pruinose discs and lacking an excipular ring around the disc.